Sometimes, you can not do what you need to with either port forwarding or port triggering. For instance: Let's say you want to host multiple games on multiple computers inside your network. Or, perhaps you want to have multiple Xbox 360s running at the same time. The bottom line is that you have multiple devices on your network who want to use the same ports. And unfortunately, you can only port forward the necessary ports to one of those nodes because you can only forward a given port to one IP address in your local network. In other words, one port per IP address. Since you can not port forward the same port to multiple devices on your network, even in a best case scenario, using port forwarding, at least one of the computers or Xbox 360s will be left with blocked ports, or a Strict NAT. There are four major problems that you may run into that would require alternatives to port forwarding. Multiple nodes in your network that want to use the same ports. ISP controlled firewalls don't allow you to receive incoming connections. Some mobile providers and 3g or 4g routers do not give their users the option of Port Forwarding. Luckily there are ways around most of these problems, and your ISP should be able to work with you to resolve them. For each problem is a recommended solution. Granted, the solutions for problems like this are not always free. You may have your ISP assign multiple external IP addresses to you. This is referred to by some ISPs as business class service. If your ISP will do this for you, your router would have several external IP addresses. You can then use the NAT section in your router to direct one of these external IP addresses to one internal IP address. Basically every port would forward from the one external to the one internal. So each node on your network would have an external IP address. Only some routers can be setup like this. It is a very nice functionality, because you can still use the firewalling portion of your router to block most ports. In essence, all ports will be open to all nodes in your network, and rather than port forwarding to open ports, you will firewall to shut down the ports that you do not want open. I must caution you, however, that most ISPs will charge per IP address issued. You will have to consult your ISP to find your actual cost. If your ISP is simply firewalling you, many times they will be able to open your ports from their end. It just takes a bit of perseverance. If they are unable to help you that way, they may be able to provide you business class service that will be more suitable for your needs. If you are locked out of your router's port forwarding section, you will have to consult your ISP. 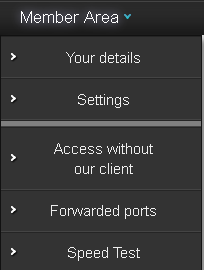 They might be able to allow you access or even configure your port forwards for you. Sometimes they will charge a small fee for this service. Lastly you may use a proxy or VPN service. This method should always work. The first step is to purchase a VPN service such as AirVPN. To use a VPN, you will need to install a VPN Client. You may either use AirVPN's client, or the OpenVPN Client. The next step is to log in to AirVPN's website, and from there you can tell them which ports you would like forwarded to your computer. It is important to note that when you connect to a VPN using AirVPN and your VPN client, you will receive a new external IP address. Once you've activated an account with AirVPN, you can easily forward ports using their web site. Next, Click the Member Area section of the navigation bar near the top right corner of the AirVPN web site. From that drop down menu select Forwarded ports. Finally enter the port number that you wish to forward, select the protocol for which you would like to forward the port, specify your local port, and click the Add button. You are done! piece of cake right? For more information on which ports to forward for a specific application please see our database of common TCP and UDP ports where you can find the TCP and UDP ports for virtually any application.